Buy a physical book for $9.99! Beyond Words revolutionizes the way that people think about the iconic game Words With Friends, While most people perceive Words with Friends as purely a word game, Beyond Words analyzes Words with Friends as a word, board game, and strategy game. 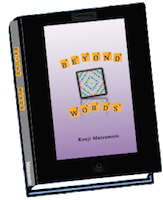 Beyond Words is written for people of all levels, from recreational players to word mavens. This book is far longer and more comprehensive than any book previously written. Written by one of the top word game experts in the world, Beyond Words is over 130 pages, contains over 100 puzzles and diagrams, as well as word lists, strategy tips, and virtually anything you need to become an expert at Words with Friends. Breaking the Game is our flagship book. Whether you a new Scrabble player or you’ve been playing for decades, Breaking the Game will make you a better Scrabble player! Words of Wisdom is our Scrabble book dedicated to more advanced Scrabble players. Focused on advanced tactics and strategies, Words of Wisdom will help you become a Scrabble master.